Leading off today: Senior forward Ryan Maddox scored 33 points as Utica Academy of Science, which began the week ranked No. 6 in the state in Class C, defeated No. 5 Cooperstown 70-56 on Monday. Senior guard Lamarcus Merchant scored 16 of his 20 points in the second half. UAS used a full-court press and alternated half-court defenses in settled situations to outscore Cooperstown 21-9 in the fourth quarter and lock down its 12th straight win. "We feel that in the fourth quarter, both teams have been running all game," UAS coach Anthony Lee said. "I think that was the difference. When they weren't able to hit shots, we were able to get out in transition and we got some key steals. ... That's why we play full-court man. 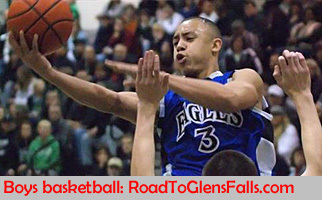 To beat us, you have to play four quarters of basketball.â€�"
Cooperstown senior Jack Lambert scored 21 points in the loss. Cooperstown had defeated the Atoms 65-50 in their Dec. 10 meeting. More boys basketball: Mynderse Academy built an early lead and rolled to a 66-44 win over Marcus Whitman, ending the Wildcats' 12-game winning streak. Marcus Whitman is ranked 12th in the state this week. Darren Miller led Mynderse with 24 points and 11 rebounds. Girls basketball: Senior Dyaisha Fair set a Section 5 record by making 10 3-pointers in a 71-44 win over Honeoye Falls-Lima. Fair finished with 39 points. Bronxville surprise: Saying he was "asked to walk away," Tim Horgan is out after a very successful 11-season run as the boys lacrosse coach at Bronxville. "I am disappointed by the way it ended, very disappointed by the way it ended," said Horgan, who was 168-51 with four Section 1 championships and one NYSPHSAA title. "I do not think I was treated fairly. This is a tough time to be a coach." Bronxville AD Karen Peterson and superintendent of schools Roy Montesano did not return phone messages or emails seeking comment, The Journal News reported. Horgan said three schools have reached out, but his wife is expecting the couple's second child and he's going to focus on family. Horgan, who said he was told before Thanksgiving that he would not be retained, will be replaced by Rob Ambrose, who received approval from the school board Jan. 17. Ambrose led Brother Rice in Bloomfield Hills, Mich. to 16 state championships before stepping down in 2013 to make a business-related move to New York. He was named U.S. Lacrosse national coach of the year in 2009. Following up: Rocky Point wrestler Kristopher Ketchum, reinstated from suspension by a court ruling last week, won his three bouts Saturday to qualify for next weekend's Section 11 championships. "I'm thankful for the opportunity to wrestle in the league tournament," said Ketchum, who scored a 7-3 decision over Miller Place's James Rado to capture the 145-pound weight class in the Suffolk League VI tournament. "It wasn't easy today," he said. "My training was off and I had quite a few people who tried to bring me down. So it was hard mentally also. I'm excited about winning but I also know I need to be better prepared for the next tournament." 2,000 points: Olean senior Sara Pfeiffer went over 2,000 career points Saturday when she hit for 41 in the Huskies' 97-32 win over Fredonia. 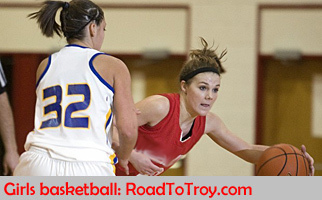 Pfeiffer made seven 3-pointers en route to her second 40-point performance in as many nights. aerobic exercise within a few days under the guidance of a health care specialist, according to a study led by two University at Buffalo researchers. The findings, released Monday in the medical journal JAMA Pediatrics, run contrary to long-standing recommend- ations for several weeks of rest before resuming regular activities. "This should start to change the approach to concussion care from being a very passive approach -- essentially don't do anything until your symptoms go away -- to one that's more active in promoting some moderate level of physical activity," said Dr. John Leddy, director of the UB Concussion Management Clinic and lead author of the study. The findings were based on the treatment of 103 teens from Western New York and Canada, each of whom first visited a participating clinic an average of five days after suffering the injury. All were tested on treadmills to determine a tolerance for physical activity and given a workout plan projected either to fall short of triggering concussion symptoms or limited to stretching. All participants were sent home with a heart monitor and visited the clinic once a week to have a new treadmill test and undergo examination. Researchers found that 52 patients prescribed the aerobic exercise program took on average 13 days to recover while those in the stretching control group took 17 days, Leddy said. All but two teens in the exercise group recovered within four weeks; seven of those in the stretching group needed more than 30 days to recover. "Sports-related concussions tend to be on mildest end on the brain injury spectrum but if you had a similar severity of injury with a fall or car accident, I don't see why this wouldn't apply," Leddy said. "We've done this with non-sports patients and adults and it helps." Looking for info: NYSSWA wrestling editor Glen Irving is updating his list of career victories for coaches in the sport. Irving is looking for information on all coaches with 100 or more career varsity victories. • The coach's status (active or retired) and the schools where he has coached. • His career record and his record for the current season. • Where the coach attended college.